Face wipes have two purposes: 1) Making things easier for me when I make a half-assed attempt at cleaning my face before crawling into bed on nights where I just can’t be bothered and 2) Making things easier for me when I make a half-assed attempt at cleaning my face when I’m on holiday. 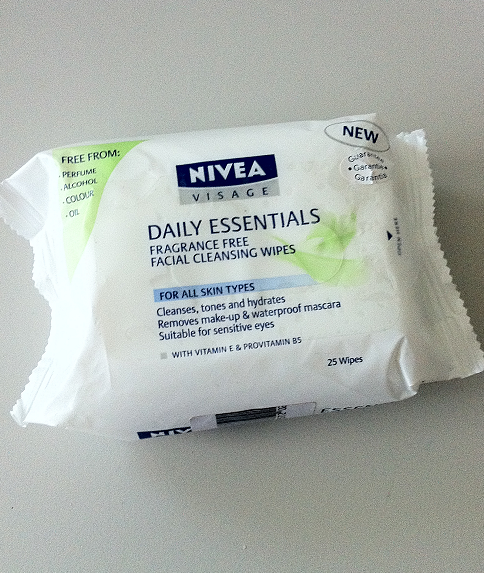 I love a dry wipe, and these ones by Nivea have just the right amount of moisture to suit my fussy face-wipe tastes. The Nivea fragrance free wipes are my holy grail wipes because they do a decent job of removing my makeup (although I am yet to find one that removes anything as well as my ol’ faithful – Cetaphil) and they cause no irritation or redness in my skin whatsoever. The Nivea Fragrance Free Facial Cleansing Wipes are currently available for purchase from Chemist Warehouse for $6.39 AUD. What I Did by Christoper Wakling (4/10) – This was one of the designated reads for the book club that a group of my friends and I have together. It wasn’t something that I could see myself picking up of my own accord, which is one of the things I love most about being part of a book club. I started out really liking it, but it ended with a terrible anticlimax that made me change my opinion of the book as a whole leading more towards the negative. Gone Girl by Gillian Flynn (8/10) – I really liked this book, and I won’t say too much about it because it’s one of those books that the less you know about it the better it will be. 1Q84 (Book 1) by Haruki Murakami (6/10) – I enjoyed this but I found it quite obvious that it was part one in a trilogy. I didn’t feel like there was a complete story in the book, which was a bit frustrating but having said that I was captivated by the story enough to look forward to reading the other two books in the trilogy. Middlesex by Jeffrey Eugenides (10/10) – A new favourite book. This was such a beautiful story, so fascinating and incredibly well told. It came highly recommended to me and now I highly recommend this to you. 01) I saw the new Anna Karenina film a little while ago and now I really want to read the book. The costumes were amazing but Keira’s hair and makeup stole the show for me. 02) If you’re in Perth and haven’t had a chance to check out the current photography exhibition at the art gallery, I suggest doing so because there are some amazing photographs on display. 03) Inspired by the positive effect they had on Kimberley‘s skin, I’ve started taking Swiss Ultiboost Hair Skin Nails to see how it works for me. Stay tuned. 05) Is anyone else watching The Americans? I started watching it on Dee‘s recommendation and it’s actually a really good show. If you liked season one of Homeland I think you will like this. 06) We all know Jennifer Lawrence fell over at the Oscars, but did we all know that Hugh Jackman and Bradley Cooper were the first ones to rush to her aid? 07) The NYX HD Studio Photogenic Grinding Blush in Georgia Peach is super pretty. I’ve never been a huge fan of the grind-style blush packaging but I’ll make an exception in this case. I’ll be reviewing this soon. 09) Feeling stressed? Why not try these 5 mini mindfullness methods that you can do anywhere? 10) Phillip Phillips (that name, lol) finally released the video for Gone, Gone, Gone and unfortunately I’m not that impressed. Great song, mediocre film clip. Colouring my hair is a massive chore for me. It’s on par for annoyance levels with filling my car with petrol and if I didn’t have hereditary greys I wouldn’t bother colouring it at all. I’ve been dying my hair for around 10 years, and it’s taken me a long time to find a colour that works for me. You’d think finding a decent brown would be easy, but it’s not. A lot of brown shades tend to have reddish or coppery undertones which is not really what I’m after in a hair colour – give me ash toned brown or give me death. I love the L’Oreal Sublime Mousse colour in the shade Pure Brown. It’s glossy and leaves no reddish tones in my hair at all. It’s also a pretty low-maintenance product to use, which gives it about a billion extra bonus points from me. I generally colour my hair using this dye once every couple of months, by which time the colour has faded a bit and my greys are back in full force. The L’Oreal Sublime Mousse in Pure Brown is available for purchase for $14.99 from Chemist Warehouse online. 32) Rimmel Scandal Eyes Mascara – I think I won this mascara in a twitter competition hosted by Priceline some time last year. It was nothing special, the brush was huge and the mascara itself was pretty basic. Let it be known that I hate this bright orange packaging with the fire of a thousand suns. 33) Stila Forever Your Curl Mascara – This deluxe sample was a gift with purchase from a Sephora order that I placed last year. Again it was nothing special, and although I like the shape of the brush I’m not sure if it would translate to a full sized version. For now I’m staying faithful to my holy grail – Lancome Hypnose. 34) Seven Wonders Moroccan Treatment Conditioner – LOL look how gross that looks. For some reason I went through this conditioner way faster than the shampoo. In fact the shampoo seems to be getting fuller and fuller every time I use it. Magic. Anyhoo, I found that if I used this and the shampoo too often during the week my hair developed quite a bit of build up. At this stage I don’t think I’ll be repurchasing this. 35) Bath + Body Works Hand Soap in Fresh Market Apple – Another month down, another hand soap finished. I’m still undecided as to whether I will keep purchasing these or try to source something a bit cheaper. 02) Movie 43 is quite possibly the worst movie I’ve seen in my entire life. How they managed to score some of the A list names in the cast is beyond me. 03) Daryl is back on my screen! 04) Did you know that Barack Obama’s director of speech writing is only 3 years older than me? Sometimes I feel like I’m achieving too much in life and I might need to slow down a bit. 05) The arm of my tortoiseshell Ray Ban Wayfarers has broken off and I kind of want to replace them with the Emma style. But then again, summer is coming to an end and I don’t wear sunglasses as much in the cooler months of the year. Dilemma. 06) Thanks to everyone who emailed me after my budget post earlier this week. You’ll be happy to know that my dad is working on an additional spreadsheet that helps keep a track of how much money per allocated category you have sitting in your savings account. Exciting nerd times ahead. 07) Southland is back on my screen! 08) After some last-minute stress and running around over paperwork that hadn’t been sent out to me, my settlement date was confirmed: February 26th. Then the next stage begins: building! 09) I ran out of my evo Love Touch shine spray during the week and have started using the Clairol Sparkle Shine Spray, which is possibly the most lightweight shine spray I’ve ever tried. Great news for my fellow fine haired gals. 10) Maymo! If you own a beagle you will understand this 100%.